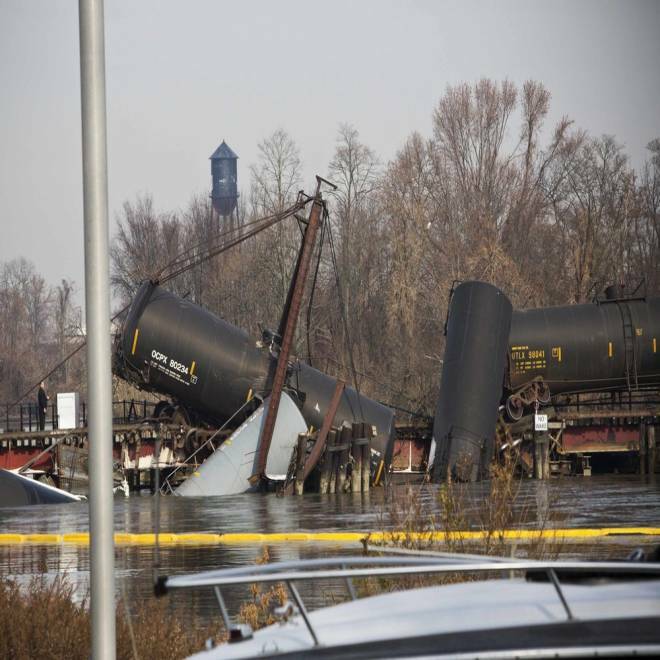 Derailed freight train cars leak vinyl chloride, a colorless, organic gas with a sweet odor sit semi-submerged in the waters of Mantua Creek after a train crash, in Paulsboro, N.J., Nov. 30. Residents were asked to stay inside their homes for hours after emergency and hazmat crews responded to a train derailment and hazardous material spill Friday morning in Gloucester County, N.J. More than two dozen people have been transported to a local hospital with respiratory problems after the incident. Gloucester Office of Emergency Management confirmed that a Conrail train derailed after the bridge it was traveling on collapsed -- for the second time in a little more than three years -- just after 7 a.m. Friday near Commerce Street in Paulsboro, Gloucester County. Six of the train's cars were dumped into Mantua Creek. Four of the cars contained vinyl chloride, a colorless, organic gas with a sweet odor. One of the train cars was compromised, releasing about 180,000 pounds of the chemical into the creek, according to Conrail spokesperson John Enright. Vinyl chloride is a colorless flammable gas that is used primarily to make polyvinyl chloride (PVC) pipes. It's heavier than air and can travel along the ground, but it evaporates quickly. Acute exposure via inhalation in humans can cause dizziness, drowsiness, headaches, and even a loss of consciousness, and it is reported to be slightly irritating to the eyes and respiratory tract, according to a statement from Gloucester County Freeholder Director Robert Damminger. Anyone who thinks they're suffering any symptoms due to exposure is encouraged to seek medical advice. "The company [Conrail] will offer assistance to residents who sought medical attention," Conrail spokesperson John Enright said. Residents were initially told to remain in their homes and local schools were placed on lockdown as emergency officials assessed air quality concerns. At least 28 people were transported from the scene to Underwood Memorial Hospital, all complaining of respiratory problems. Officials confirm that some of the injured are workers from the Paulsboro Marine Terminal. “Personal safety is our number one concern,” U.S. Coast Guard Petty officer Nick Ameen told NBC10. Officials determined at about 11 a.m. that air quality had improved, meaning the situation was under control. However, they cautioned that the next significant threat will be when Conrail attempts to lift the cars out of the water without releasing any more chemicals. Paulsboro School District was on lockdown until 11 a.m. Students were dismissed when officials determined the air quality had improved. The School District's Superintendent Dr. Frank Scambia told NBC10 that 50 students from all three of the district's schools were on lockdown inside the gymnasium at the high school. The Fire Department also evacuated all employees on Commerce Street. "The whole day is a wash," Doug Ricotta, owner of D&D Italian Bakery, told NBC10. "Everything's shutdown." Roadways leading into Paulsboro were closed. Officials say the biggest concern right now is the time when the cars are lifted out of the water, although they've already devised a plan to contain the vapors. "Right now, the remaining chemical is frozen, at the bottom of the car," a Paulsboro official said. "[but} The Conrail engineers and hazmat crews are experts at plugging holes and sealing things and I'm sure they'll do what they need to do to stabilize that product." The cars, however, will not be lifted out of the water until at least Saturday because it will take a day to bring in a crane large enough to lift the cars.